Thumbnail views of all 21 Lamb clip art images. Cute Lamb Tubes for your Easter and Spring Designs. In celebration of the coming spring, here’s a collection of adorable, plush lambs. 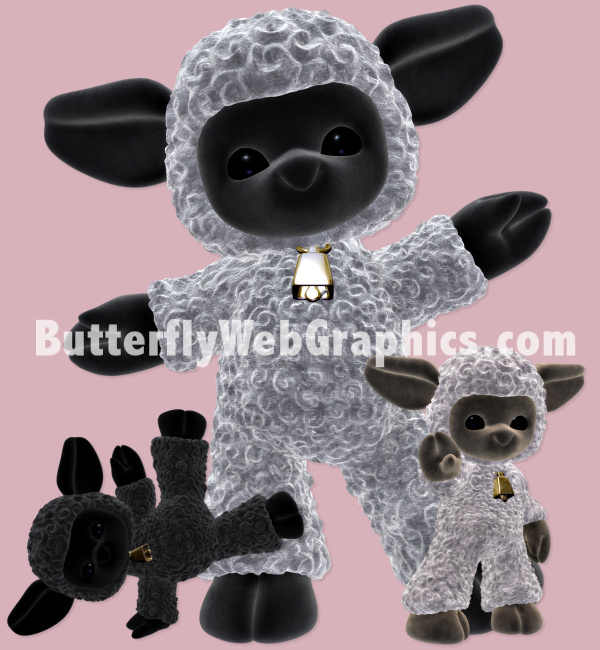 Three versions are included, a black lamb, a gray lamb, and a brown lamb. I’ve recently brightened up these lambs, which were one of my early 3D packages. The paisley seamless tile on this page is included in this package. There are 21 royalty free, high-quality clip art images included in this package. All of these graphics have transparent backgrounds (except for the background tile) making it easy for you to use them as tubes or nozzles–or merely to drop into your design. The size of these images varies but they are approximately 1500 X 2000 pixels. All are 300 DPI, making them great for print projects. They can be used for personal or commercial projects, including web design, template design, candy wrappers, scrapbook designs, etc. This package is one zip file which is approximately 50 MB.